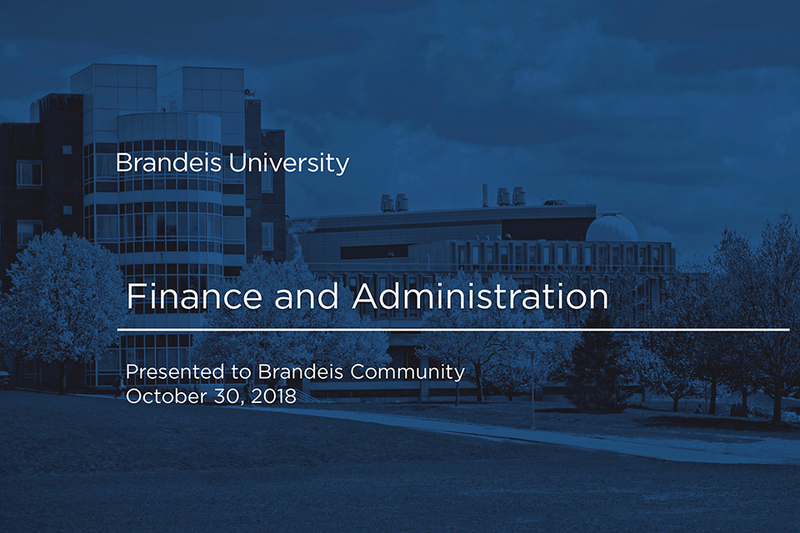 Finance and Administration's town hall meeting was held on Tuesday, October 30, 2018. The meeting included updates on the progress of the Finance and Administration FY18 goals and a discussion on the new FY19 goals. There was a topical discussion on the University's new financial framework, campus sustainability, Human Resources, and major Information Technology projects, such as Workday, and security and wireless coverage. Jim Gray, vice president for campus operations; Sam Solomon, chief financial officer; Stew Uretsky, executive vice president for finance and administration; and Nick Warren, chief investment officer, reported on developments in their areas and answered questions. David Albrecth, director, networks, systems and security and Peter Nash, associate vice president for information technology also reported on developments in ITS in Chief Information Officer, Jim La Creta’s absence. Below is the video of the October 30 meeting.